There’s something inherently fascinating about black holes. Maybe it’s that they’re invisible beasts lurking in space that sometimes rip passing stars in half and scatter their remains. Whatever it is, these strange cosmic objects continue to captivate scientists and laypeople alike. But where do black holes come from? How do they form, and what gives them such awesome destructive power? Before we can answer that, we have to ask an even more fundamental question: Just what is a black hole? “Basically, it’s an object or a point in space where the gravitational pull is so strong that nothing can escape from it,” astrophysicist Neta Bahcall, of Princeton University in New Jersey, told Live Science. Even light waves are sucked in, which is why black holes are black. These bizarre objects arise like phoenixes springing from the ashes of dead stars. When massive stars reach the ends of their lives, the hydrogen that they’ve been fusing into helium is nearly depleted. So, these monster stars begin burning helium, fusing the remaining atoms into even heavier elements, up until iron, whose fusion no longer provides enough energy to prop up the star’s outer layers, according to the Swinburne University of Technology in Australia’s Centre for Astrophysics and Supercomputing. These top layers collapse inward and then explode out as a powerful and bright burst called a supernova. Yet, a small part of the star remains behind. Albert Einstein’s equations of general relativity predict that if this remnant has about three times the mass of Earth’s sun, the remnant star’s powerful gravitational force will overwhelm everything else and the material it’s made of will be crushed to an infinitely small point with infinite density, according to NASA. The known laws of physics can’t actually handle such mind-bending infinities. “At some point, they break down and we don’t really know what happens,” Bahcall said. If this stellar vestige is alone, a black hole will generally just sit there not doing much. 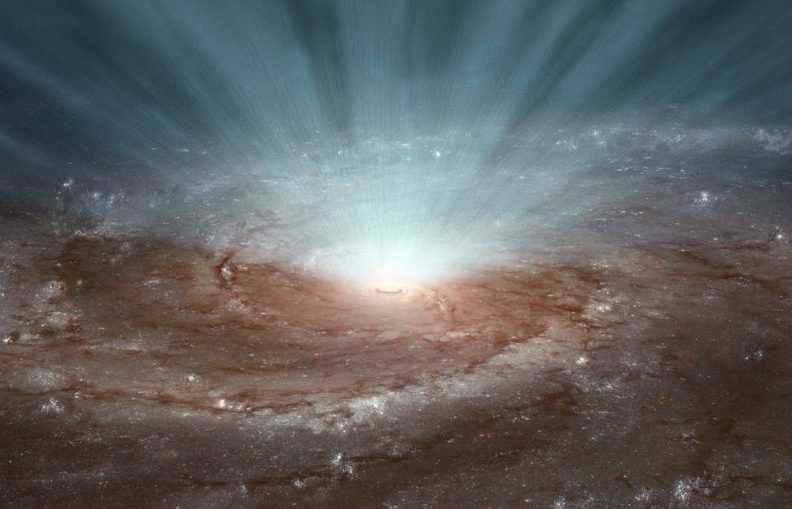 But if gas and dust surround the object, that material will get sucked into the black hole’s maw, creating bright bursts of light as the gas and dust heat up, swirling around like water going down a drain. The black hole will incorporate this mass into its own, allowing the object to grow, Bahcall said. If two black holes meet, the powerful gravity of each one will attract the other, and they will get closer and closer, spinning around one another. Their collective mass will shake the fabric of nearby space-time, sending out gravitational waves. In 2015, astronomers discovered such gravitational waves via the Laser Interferometer Gravitational-Wave Observatory (LIGO), Live Science previously reported. “That was the first time we could actually see black holes and confirm that they exist,” Bahcall said, adding that the results were also a beautiful corroboration of Einstein’s predictive equations. Scientists had found indirect evidence of black holes before, witnessing stars in the centre of our Milky Way galaxy orbiting around a gigantic invisible object, Universe Today reported. How such supermassive black holes — which can have billions of times the mass of our sun — form is an outstanding question, Bahcall said. Researchers believe that these supermassive black holes were once much smaller, forming as more modest-size black holes in the earliest days of our universe. Over cosmological time, these objects absorbed gas and dust and merged with one another to grow, ending up as colossal monsters. But many of this story’s details remain fuzzy, Bahcall said. Astronomers have observed objects called quasars, which glow brighter than thousands of galaxies put together and are thought to be powered by supermassive black holes consuming matter. Quasars have been seen back as far as the first billion years after the Big Bang, when our universe formed, leaving scientists to scratch their heads over how such enormous objects could form so quickly, Bahcall said. “That really highlights and adds complexity to the question,” Bahcall said, and it remains a very active topic of research.